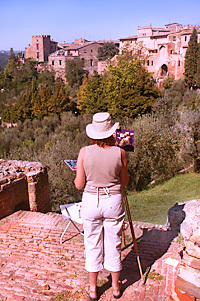 I don't know about you but I hate it when the temperature plummets and I want to go out painting. My fingers are extremely sensitive to cold because when I was sixteen I almost gave myself frostbite on a sub-zero January day. If you ever are frostbitten you remain prone to it happening again the rest of your life. I can verify that if you almost get frostbitten you are also more prone to it again. I keep buying different wool and fleece gloves, and mitts, and fingerless gloves, and glove/mitt combos, and crack-n-heat packets, and thinsulate liners – even electrified gloves – with the hope I can find a solution to painting during the winter. But heat packets don't disperse heat very well and gloves constrict the circulation around my fingers, and every mitt I've worn makes my hand feel like a lobster claw. So I asked my wife to make me one. She said, "No, you dummy, just stick a wool hiking sock over your hand and cut a hole in it." I'll be giving this a go up in the mountains of Vermont with Stape Kearns. Thanks for posting. And please give Stapleton hello from me. I hope to meet him someday soon.